Installing the PCIe2 card is a cold-service operation. You must power off the server before installing the PCIe2 card. If you are replacing a PCIe2 card, remove the faulty or obsolete PCIe2 card first, then return to this procedure, Step 2. See Install a PCIe2 Card Into the PCIe2 Mezzanine Board. If you are installing a new or an additional PCIe2 card, see Preparing for Service. If you are installing the PCIe2 card as part of another component's removal or installation procedure, go to Step 2. Align the PCIe2 card to the location where it installs into the PCIe2 mezzanine board. The component side of the PCIe2 card is up, and the PCIe2 card bracket is to the rear of the chassis. Swivel the clasp open to provide clearance for the PCIe2 card bracket (pane 1). Rotate the PCIe2 card to the left so that the tang of the PCIe2 card bracket enters the slot on the PCIe2 mezzanine board rear panel, and the card edge begins to enter the connector (pane 2 and pane 3). Press the PCIe2 card into the card edge connector so that the PCIe2 card is fully seated (pane 3). Swivel the clasp closed to secure the PCIe2 card bracket and tighten the captive screw (pane 4). 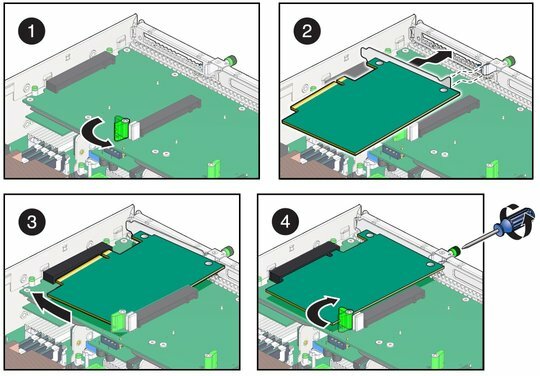 If you installed the PCIe2 card as part of a replacement operation, go to Step 8. If you installed the PCIe2 card as part of another component's removal or installation procedure, return to that procedure. See Component Service Task Reference for assistance. If you have installed a new PCIe2 card, go to Step 8.